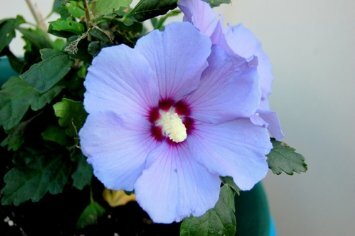 Family: Malvaceae (Hibis-cus: ancient Greek and Latin name, syri-acus: Syrian) Absolutely the best blue! Its large, singel, rich royal blue flowers are certain to draw attention. 'Blue Satin' is a strong growing, uniform plant with rich color. Hybridized by Rien Verweij of the Netherlands. AWARDS: Award of Recommendation Royal Boskoop Horticulture Society. Prefers Full Sun. Mature Height: 8-12 feet. Immediate shipping in 4" pot.